According to the advisory, affected browsers are not properly handling the "q" query parameter in the URLs, thus fail to display the portion of an https URL before the ?q= substring in the address bar. Since the address bar of a web browser is the most reliable and essential security indicator, the flaw can be used to easily trick Xiaomi users into thinking they are visiting a trusted website when actually being served with a phishing or malicious content, as shown in the video demonstration below. The phishing attacks today are more sophisticated and increasingly more difficult to spot, and this URL spoofing vulnerability takes it to another level, allowing one to bypass basic indicators like URL and SSL, which are the first things a user checks to determine if a site is fake. The Hacker News has independently verified the vulnerability using a PoC the researcher shared with our team and can confirm it works on the latest versions of both web browsers—MI Browser (v10.5.6-g) and Mint Browser (v1.5.3)—that are available at the time of writing. What's interesting? The researcher also confirmed The Hacker News that the issue only affects the international variants of both the web browsers, though the domestic versions, distributed with Xiaomi smartphones in China, do not contain this vulnerability. "The thing that struck me most was that only their overseas or, international versions were having this security bug and not their Chinese or, domestic versions. Was it done deliberately thus?" Arif told The Hacker News in an email. "Are Chinese device manufacturers intentionally making their OS, applications, and firmware vulnerable for their international users?" Another interesting though weird thing is that upon reporting the issue, Xiaomi rewarded the researcher with a bug bounty, but left the vulnerability unpatched. 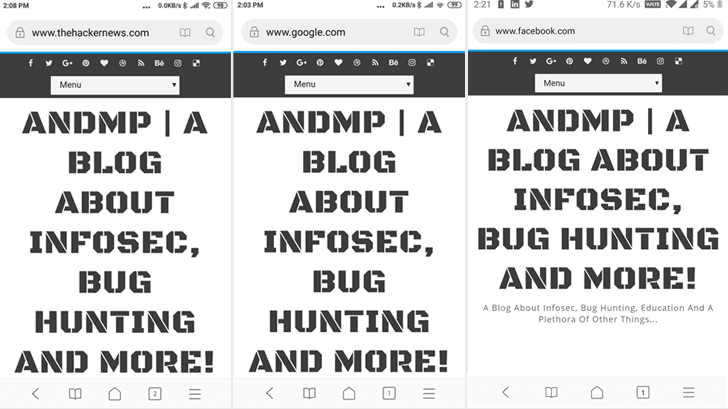 "The vulnerability impacts millions of users globally yet the bounty offered as such was, $99 (for Mi Browser) and another $99 (for Mint Browser)," the researcher said. We also reached out to Xiaomi two days prior to publishing this report for additional comment and learn if the company has plans to release a patched version anytime soon, but the mobile vendor provided a weird response. "I would like to inform you that as of there is no official update regarding the issue. However, would request you to stay connected with the forum page for further details in this regards," the company said. This is the second recently-disclosed severe issue that researchers have identified in pre-installed apps on more than 150 million Android devices manufactured by Xiaomi. 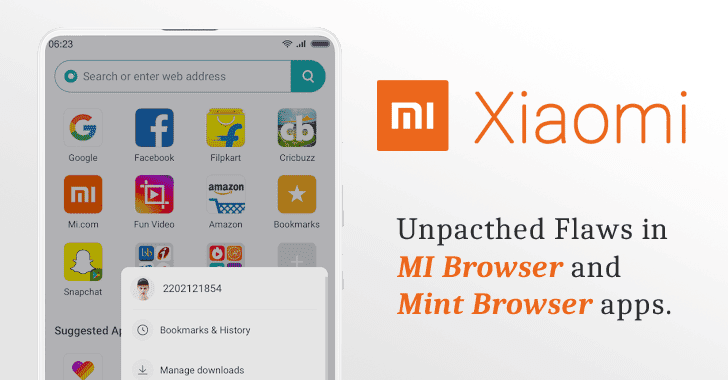 Just yesterday, The Hacker News published details of a report explaining how attackers could have turned a pre-installed security app on Xiaomi phones, called Guard Provider, into malware by exploiting multiple vulnerabilities in the app. The bottom line: Android users are highly advised to use modern web browsers that are not affected by this vulnerability, such as Chrome or Firefox. Besides this, if you are using Microsoft Edge or Internet Explorer browser on your desktop, you should also avoid using them since both browsers also contain a critical vulnerability which has not yet been patched by the tech giant. "It was reported through our bounty program, which encourages security experts to report vulnerabilities. Xiaomi values feedback from the security community, and are committed to constantly improve based on all feedback so as to build better and safer products."